Running a successful email marketing agency is not just about running great campaigns. It is also about operational and cost efficiencies. So how do you work efficiently as an email marketing agency with multiple clients across multiple marketing and data systems? Here are 5 tips that can help you. 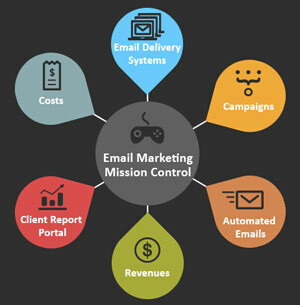 As an email marketing agency, you not only run email campaigns, you are email campaigns. You optimize email campaigns. You strategize about email campaigns. Sometimes, you even dream about email campaigns. There are a lot of competing email marketing agencies out there, you want to stick out by create campaigns that look good and perform for your clients. Not all emails are created equal. Some generate more revenue, others are informative and some create brand value. And not all clients create the same value. You can load balance your costs by using different ESPs or SMTPs for different segments of clients or campaigns (even using multiple providers for the same client). You may want to manage multiple low-budget clients on a single Amazon SES account, for example. While some clients, for a variety of reasons, including vertical and content, you’ll want to setup on their own SES account. Your premium customers may be better served on a full or premium service ESP. Cost-efficiency is a critical factor to your bottom line profits, but be careful not to let your cost savings sacrifice your operational efficiency. There can be operational costs related to working with multiple platforms, so it’s important to find the correct balance and combination of email delivery solutions that will be most efficient for your agency. Save money on ESP services and delivery when you can. As long as saving money doesn’t end up costing you more money or time. Case in point: you can reduce your total costs by segregating which of your clients are served by which of your providers. Ideally you then want to have a single dashboard where you can manage all clients, all providers, and all campaigns in the same place. But then having to manually access multiple systems, manually aggregate results from each of those systems, and manually compute statistics can create overhead which is not cost efficient. When shuttles were sent into space, all systems were managed from a single mission control center. Your agency needs to operate the same way. It is not efficient to manage multiple control centers. You can learn from each of the email marketing platforms you use and all of your clients can benefit from the lessons, stats, and insights you learn from other clients’ campaigns. To achieve this, requires email marketing integration across all clients. o	Automate campaigns based on triggers, profiles, events and templates. o	Allow you to also see a bird’s eye view that provides you the insights gained from all of your campaigns and experience. A single platform gives you power. It enables you to use the combined data of all of your clients to benefit each of your clients. An automated platform delivers the perfect quantity, timing, and efficiencies for sales and marketing teams. But to use it properly, you must carefully manage risk and deliverability. Unfortunately, email is a medium that can often be abused. Preventing fraud protects you and your clients. You must avoid lists that are old, not compliant, or otherwise questionable. Do not work with these kinds of lists. Do not take on clients that use these kinds of lists. Sometimes, though, clients with the best intentions did not operate in the past with the best infrastructure. Your client may have a totally legitimate list that was gathered with proper opt-ins, but was not carefully verified for email validity. Or perhaps your client just hasn’t emailed his list in a while. But it is a problem that is easy to solve. There are companies you can partner with that identify and remove harmful email addresses from your lists. Sending emails to invalid addresses negatively affects your sender reputation, which results in fewer of your emails actually getting to inboxes. A company that can validate the email addresses before you send to them may be a great investment (and a nice upsell). A clean email list is fundamental to a successful email campaign. It is wise to invest in fundamentals. Everyone tracks open rates, click rates, and completed conversions. Everyone talks about inbox placement. But for those metrics, your clients frankly, don’t need you. As an email marketing agency, you need to drill down further into metrics and KPIs for each campaign and each client. Do you know your deliverability statistics for each client by domain or ISP? Can you calculate the deliverability to ISP by ESP? For example, what Client ABC’s rate to Yahoo email addresses sent through Amazon SES? By knowing this information, you can then segment your list to take advantage of the best deliverability and performance to each ISP from each ESP. Moreover, can you track each campaign by all of these? To provide your clients the value they deserve from an email marketing agency, you need to present them with actionable insights based on many KPIs. You need to help them understand the metrics you track and get value (beyond the sale) from each campaign to improve the next. What works for one client may not work for another. What works to one ISP may not be the best for another. The statistics you gather must be interpreted into actionable insights that your customers can use to improve their business. This makes having you as their agency an invaluable asset. When you are good at what you do, it is commonplace to get complacent. Do not fall into this trap. You can always improve. You can always learn new things. You can always test new theories and try new channels. For example, how about adding a SMS text message drop to your next campaign? Or maybe geotargeted content? When you find a formula that works, by all means – continue to use it. Just don’t forget that there may be a formula out there that works even better! Be conservative with clients’ test budgets, but be adventurous with new ideas. By following these 5 best practices, your email marketing agency can improve its efficiency and its performance. These are easy improvements that will go a long way for you, your business, and your clients.